You've got questions about iTunes. Kirk McElhearn has the answers. You’ve got some music files on your Mac, and they all look alike in the Finder. If you want to find which ones are AAC files and which are Apple Lossless, what do you do? Well, I’ve got the answer. 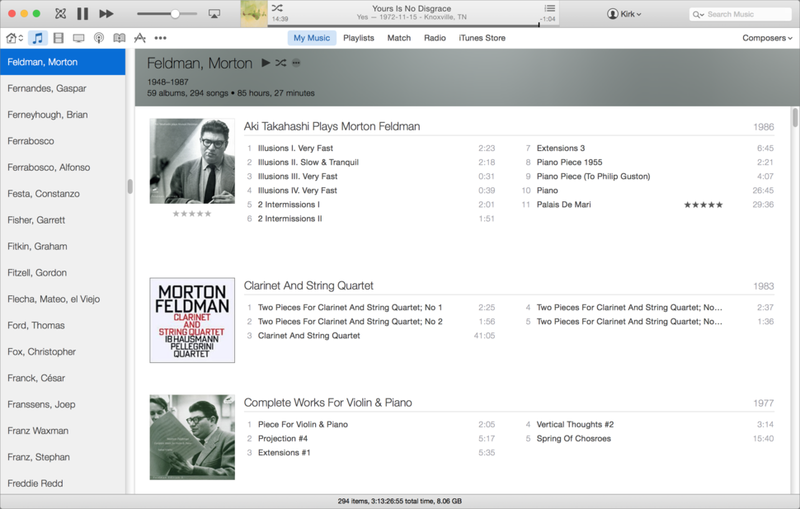 I also discuss the Case of the Missing Audio Files, and look at some possible ways to view classical music in iTunes. 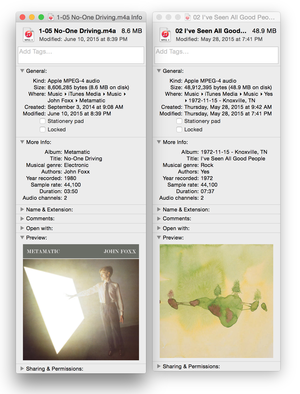 To the left, a lossy AAC file; to the right, an Apple Lossless file. Q: How can I tell if a file with an .m4a extension is a lossy AAC file or an Apple Lossless file? It’s a bit annoying that Apple uses the same file extension for both lossy and lossless files, especially because AAC is part of the MP4 specification, and Apple Lossless is not. If you’re looking at a file in the Finder, it’s not that easy to tell one from the other. The Kind that the Finder shows for both files is Apple MPEG-4 Audio. In the screenshot to the right, you can’t tell that the file on the left–John Foxx’s “No One Driving”–is an AAC file, and that Yes’s “I’ve Seen All Good People” is lossless. You can see the difference in the file size, which is a good indicator, but you need to mentally calculate the ratio of the size and duration. Within iTunes, you can tell which files are lossless in other ways, such as by displaying the Bit Rate column in list views. Lossless files have higher bit rates, generally above the highest AAC bit rate of 320 kbps. You can also make a smart playlist to find all your Apple Lossless files. Use the condition Kind Contains Apple Lossless. In the last line, you can see that the file is alac, or Apple Lossless Audio Codec. Q: Somehow, over time, hundreds of files (from a library of maybe 5000 songs) have been deleted from my iTunes library folder. I have scores of empty folders that once contained all the tracks of albums. For other albums, just one, two or more files are gone. I back these files up daily, but the problem is that I’m not aware when files suddenly disappear, so the backups often delete files in order to conform with what is in the (new) iTunes library. I don’t see anything that links those files that are lost; it seems entirely random. What can I do about this? I’ve been getting a lot of questions about this recently. This has happened to me too. It started some time last year, perhaps just after iTunes 12 was released. I back up my music with Time Machine, as well as with a standard copy, and Time Machine keeps older versions than those in my most recent full-disk backup. I have no idea why iTunes deletes files, and I wish Apple could figure this one out. In the meantime, I’d recommend using Time Machine to make sure you don’t lose anything. Q: I would like to use iTunes for my classical music collection, displaying music sorted by composer. The album, in my case a symphony or string quartet, for example, is then shown with all its “songs” (movements) which takes up too much space. Is there a way to list the albums without displaying the songs? My iTunes library in Composer view. Click the View Options menu at the top-right of the iTunes window to change views. For the albums above, many of which contain short works, it makes sense for each track to be listed. But if you tag your albums per work—for example, a recording of Mahler’s 3rd symphony is an album—then this view isn’t ideal. But when you click an album to play it, iTunes expands that album and displays its tracks. You can’t always get what you want. Sometimes you have to bend to iTunes’ will.